If we have tasted the Lord’s goodness, then we can certainly share the Lord’s goodness. When we recognise that the Lord has given His finest to the undeserving, we learn that our acts of kindness don’t rely on whether or not the recipient deserves our kindness. God’s goodness is super abundant. Our actions are subsequent to a prior relationship. Our kindnesses reflect our Father’s behaviour. Our human responsibilities flow from our God-directed love and obedience. Is 53:4-6 Surely he took up our infirmities and carried our sorrows, yet we considered him stricken by God, smitten by him, and afflicted. But he was pierced for our transgressions, he was crushed for our iniquities; the punishment that brought us peace was upon him, and by his wounds we are healed. We all, like sheep, have gone astray, each of us has turned to his own way; and the LORD has laid on him the iniquity of us all. Is 53:12 Therefore I will give him a portion among the great, and he will divide the spoils with the strong, because he poured out his life unto death, and was numbered with the transgressors. For he bore the sin of many, and made intercession for the transgressors. Jn 3:16 “For God so loved the world that he gave his one and only Son, that whoever believes in him shall not perish but have eternal life. Jn 10:11 “I am the good shepherd. The good shepherd lays down his life for the sheep. Ro 8:32 He who did not spare his own Son, but gave him up for us all—how will he not also, along with him, graciously give us all things? 2 Co 8:9 For you know the grace of our Lord Jesus Christ, that though he was rich, yet for your sakes he became poor, so that you through his poverty might become rich. Eph 5:2 and live a life of love, just as Christ loved us and gave himself up for us as a fragrant offering and sacrifice to God. 1 Ti 1:15 Here is a trustworthy saying that deserves full acceptance: Christ Jesus came into the world to save sinners—of whom I am the worst. 1 Ti 1:16 But for that very reason I was shown mercy so that in me, the worst of sinners, Christ Jesus might display his unlimited patience as an example for those who would believe on him and receive eternal life. 1 Pe 2:24-25 He himself bore our sins in his body on the tree, so that we might die to sins and live for righteousness; by his wounds you have been healed. For you were like sheep going astray, but now you have returned to the Shepherd and Overseer of your souls. My parents had the opportunity to grow up on small farms. After my father’s mother died, my grandfather closed off a career teaching maths and took up farming. And my mother’s family supplemented their income and food stocks by alternately renting out sections of property or farming it themselves. Though I grew up in a military family and travelled the globe, I had opportunity to summer on the family farms and participated in the labour, planting, weeding, fertilising, harvesting and storing various crops of maize, soybeans, potatoes and tobacco, along with several sessions in the fields and barns baling and putting up hay. I learned much from those experiences. Three lessons relating to those experiences connect well to the task of reaching the lost and I think are helpful for all of us to keep in mind in our efforts to reach our area with the saving message of Jesus Christ. I now have fond, almost romantic, memories of my joining in with my relatives on the farm, but the reality was far different. I spent many hot, humid and monotonous days carrying out back-breaking work. In order to ensure a crop at the other end of the season, a lot of work had to happen before the crops were planted. And harvest proved tiring as well. Many summers my cousins and I worked cutting, raking, baling and putting up hay. Stacking 40-80 pound bales of hay in a steamy barn loft at the peak of a summer day made me feel like every ounce of moisture in my body was draining out my pores! If we desire a harvest of souls for the glory of Christ in our district and throughout London, we must labour. The industrious farmer starts his hard and demanding work early and quits late. He endures the cold, the heat, the rain, and the drought. He plows the soil whether it is hard or loose. He does not wait for his own convenience, because the seasons do not wait for him. When the time comes to plant, he must plant; when weeds appear, he must remove them; and when the crop is mature, he must harvest it. What drives the man to such hard toil is the harvest. And I can think of no better harvest than eternal souls won for God’s glory. Let us labour then! 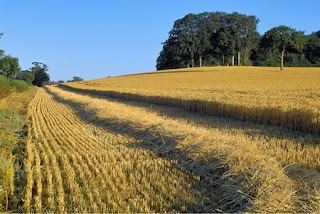 During those long days of effort, day after day, the farmer understands that harvest is still far off and no fruit will be enjoyed for months to come. But the farmer has come to learn that today’s dry efforts are what bring tomorrow’s bounty. I planted the seed, Apollos watered it, but God made it grow. So neither he who plants nor he who waters is anything, but only God, who makes things grow. The man who plants and the man who waters have one purpose, and each will be rewarded according to his own labor. If husbandmen do not spare their toils, that one day they may obtain fruit, and if they patiently wait for the season of harvest; how much more unreasonable will it be for us to refuse the labors which Christ enjoins upon us, while he holds out so great a reward? Harvest time does come! We may plant and we may water, and not see any visible return on the investment for a long time or perhaps even in our lifetime, but the increase in the field will come from the Lord. London Night Walk_0001, originally uploaded by Doug McMasters. 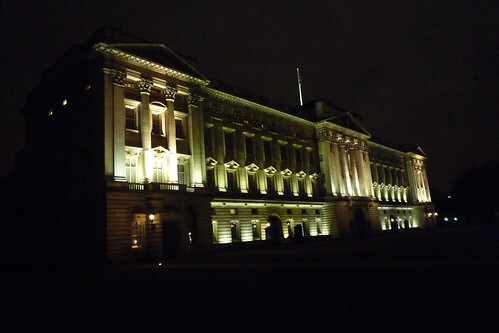 Visit here for some snaps of my favourite city. We had an excellent time with James White from Alpha and Omega Ministries. 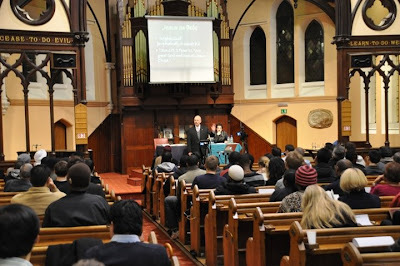 His debating, preaching and teaching in London stand as highlights to us for 2008. And the serious and fun talks we shared were most enriching and enjoyable. This is, practically, a promise that, by diligent meditation and the giving up of our whole mind to our work for the LORD we shall make a progress which all can see. Not by hasty reading but by deep meditation we profit by the Word of God. Not by doing a great deal of work in a slovenly manner, but by giving our best thought to what we attempt, we shall get real profit. "In all labor there is profit" but not in fuss and hurry without true heart-energy. 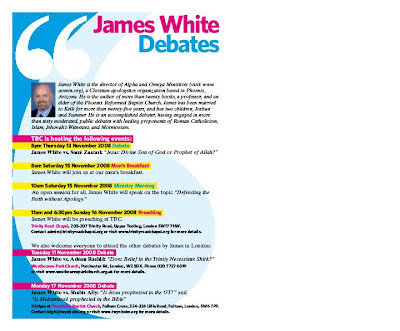 Trinity Road Chapel is joining other churches in hosting a number of formal debates between James White and various Islamic scholars. The topics chosen for these moderated, formal debates will give opportunity to make known essential areas of difference between Christians and Muslims. And James White, an accomplished apologist and debater, will make those differences known very clearly and in an irenic manner. Can you help us spread the news of these debates and teaching opportunities? Please distribute this email and the flyers as widely as you can—pass them along to others you think may have an interest. James White is the director of Alpha and Omega Ministries (visit www.aomin.org), a Christian apologetics organization based in Phoenix, Arizona. 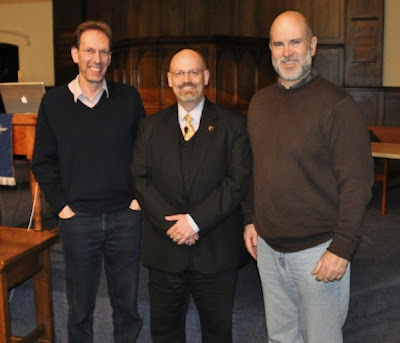 He is the author of more than twenty books, a professor, and an elder of the Phoenix Reformed Baptist Church. James has been married to Kelli for more than twenty-five years, and has two children, Joshua and Summer. He is an accomplished debater, having engaged in more than sixty moderated, public debates with leading proponents of Roman Catholicism, Islam, Jehovah's Witnesses, and Mormonism. James White vs. Sami Zaatari: "Jesus: Divine Son of God or Prophet of Allah?" James White will join us at our men's breakfast. An open session for all. James White will speak on the topic "Defending the Faith without Apology." James White will be preaching at TRC. Trinity Road Chapel, 205-207 Trinity Road, Upper Tooting, London SW17 7HW. Contact admin@trinityroadchapel.org or visitwww.trinityroadchapel.org for more details. James White vs. Adnan Rashid: "Does Belief in the Trinity Necessitate Shirk?" James White vs. Shabir Ally: "Is Jesus prophesied in the OT?" and "Is Muhammad prophesied in the Bible?" 7:30pm at Twynholm Baptist Church, Fulham Cross, 324-326 Lillie Road, Fulham, London, SW6 7PP. Contact leigh@twynholm.org or visitwww.twynholm.org for more details.